Red Planet Classic Slot Guide & Review - Casino Answers! Red Planet is a 3-reel, 5-line classic slot machine developed by Cryptologic. You can play the Red Planet classic slot machine at VIP Casino and Casino Joy. Coin sizes on the Red Planet online slot machine are $0.01, $0.05, $0.10, $0.25, $1, $2 and $5. You can change the coin value in the top left corner of the screen. You can bet 1-5 coins by using the “Bet One” or “Bet Max” buttons. For each coin that you play, you will activate another payline. Casino Answers recommends playing the maximum bet at all times to be eligible for the top jackpot. Red Planet is a penny slot, meaning you can bet as little as $0.01. The highest total bet you can make on a spin on the Red Planet slot machine is $25 per spin. To play Red Planet, hit the “Spin Reels” button or “Bet Max” button. The highest paying symbol on the Red Planet classic slot machine is the Red Planet symbol. On a 5-coin bet, 3 Red Planet symbols will pay out an 8000 coin top jackpot. If you are not betting the maximum number of coins, you will only win 5000 coins. If you hit 3 Red Planet symbols on the Red Planet slot, you are guaranteed a big win at VIP Casino! There are 8 winning combinations on the Red Planet slot machine. The full payout schedule is as follows (1/5 coin payouts in parenthesis): 1 Rover symbol (2), 2 Rover symbols (6), 3 UFO symbols (10), 3 Rocket Ship symbols (20), 3 Earth symbols (50), 3 Rover symbols (80), 3 Alien symbols (200) and 3 Red Planet symbols (5000/8000). Red Planet has a basic autoplay mode found at the right of the game reels. You can play up to 99 autoplay spins at a time. To start autoplay, hit the “Bet Max” or “Spin Reels” button as you would to normally play Red Planet. To stop the autoplay mode on the Red Planet reel slot machine, hit the “Stop” button below the spin counter. If you’re looking for a space-themed classic slot machine, you can’t go wrong with Red Planet. It’s biggest strength is its 8000 coin top jackpot, which is a rather sizeable top payout for a reel slot machine. 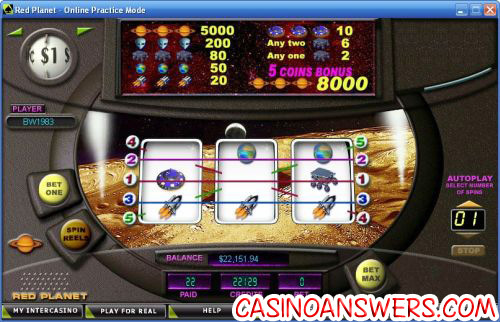 To play the Red Planet slot game, please visit VIP Casino. Where can I find more sci-fi themed slot games? For more sci-fi or space themed slot machines, please read our Martian Money Classic Slot Review, Alien Invasion Classic Slot Review, Outta This World Video Slot Review, Cosmic Quest 1 iSlot Review and Cosmic Quest 2 iSlot Review. Can players from the United States play the Red Planet slot game for real money? Unfortunately, American players cannot play the Red Planet slot machine for real money at this time. Luckily, if you’re USA-based, you can still play most of the other alien slot machines we listed above, with the exception of Martian Money. Where can I find a Flash game of the Red Planet slot machine? You can find a Red Planet Flash game that you can play for real money at the VIP Casino and Casino Joy Instant Play online casinos. If you experience difficulties with the Instant Play Flash casino software, make sure you have the latest version of Adobe Flash Player installed on your computer.